Miami and San Antonio play for all the glory, can the Heat repeat as NBA Champs? Or will the Spurs cement a dynasty? "They're the best two words in sports: Game 7." So said Heat coach Erik Spoelstra after his team pulled out a gutsy overtime in Game 6 of the NBA Finals against the San Antonio Spurs on Tuesday night. The win set the stage for just the fourth Finals Game 7 in the past 20 years, and history is on the side of the host Heat. The home team has won every Game 7 since the NBA switched the Finals to a 2-3-2 format. The home team is 14-3 over all Finals Game 7s, the last road win came when the Washington Bullets beat the Seattle Supersonics in 1978. The stakes could not be higher. Not only is a championship on the line, but legacies for both sides can be cemented with a win. For the Heat, a win would give them two crowns in a row following the disappointment against the Dallas Mavericks in the 2011 Finals, the first of the Big Three era. San Antonio can win its fifth title since 1999, cementing Tim Duncan's status as one of the best front-line players in NBA history. "As a competitor you love it, because you know you have an opportunity and it's up to you," Heat guard Ray Allen said Wednesday. "We have a chance in our building to make something great. All of our legacies are tied to this moment, this game. It's something our kids will be able to talk about that they were a part of. Forever will remember these moments, so we want to not live and have any regrets." The Heat got another triple-double from LeBron James in Game 6 (his second of the series), but for the first three quarters he struggled mightily yet again. When he played with a small lineup of three wing shooters with center Chris Andersen in the fourth, though, James found plenty of scoring opportunities, picking up 16 of his 32 points. The Spurs would prefer James keep passing to his teammates than attacking the rim like he did late in Game 6. But if Miami's shooters play as well as they did Tuesday, there will be little San Antonio can do. 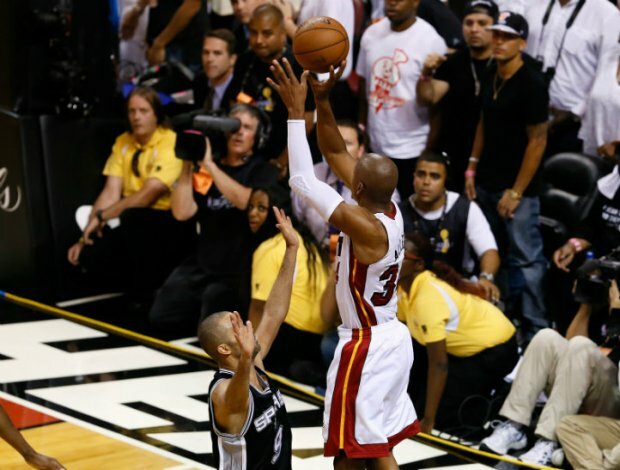 Mario Chalmers, Mike Miller, Shane Battier and Allen combined to shoot 10 of 14 from three-point range in Game 6. Dwyane Wade said Wednesday that his left knee was swollen and stiff when he woke up, the result of a collision with the Spurs' Manu Ginobili in the first half of Game 6. He said it will not keep him out of Game 7, though, saying with just one game left, "you muster it up, you give it. So I'll be fine." What is more certain is the status of LeBron James' headband. Though he played the final 14 minutes of Game 6 without it, he will open Game 7 wearing one. "A little superstitious," James said. Meanwhile, San Antonio will look to revive their offense, which stalled for much of the fourth quarter and overtime. Tim Duncan scored 30 points on Tuesday, but none came after the third quarter. Tony Parker shot just 6 of 23, and Manu Ginobili had one fewer turnover (8) than points (9) in the loss. Still, both teams like their chances in the winner-take-all Game 7, which could go down as one of the greatest in NBA history if the past six games have been any indication. "I think — I know — that game will go down as one of the best finals games that's been seen," Heat guard Dwyane Wade said. "But I think this series will go down as being one of the most competitive, bizarre series that's been seen. So this is what you pay for to watch. You pay to watch two great teams battle to the very, very end, and that's what we'll do (Thursday). It will be to the very last second." Game 7 tips off at 9pm ET, with coverage on ABC.